Naruto is a manga and anime works of Masashi Kishimoto. Naruto Uzumaki is the main characters of this story. He is a ninja of Konoha village. Naruto characterized as a ninja vibrant, cheerful, hyperactive, and very ambitious in reaching his ideals to become a Hokage. 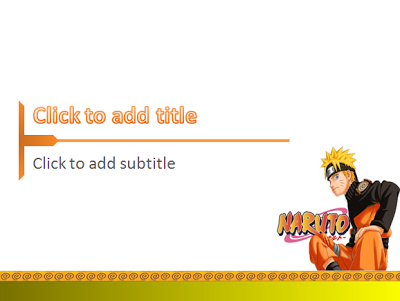 In accordance with the characteristics of Naruto figure are extremely ambitious, we create a template with a background that shows Uzumaki Naruto with an ambitious gaze. Why is this became a theme of a PowerPoint template? Because we want to make a difference in the presentation, using cartoon characters, manga and anime. With the intention that your presentations become more diverse and different from the others.